I can't delve into the minds of other drivers. I'd like to and that's why I carry a cordless drill with a 1/2" carbide tip. However, given that at 45, I'm still too pretty for prison, I'll just have to hazard a guess. It's a Lincoln. He's got some scratch and like to buy American. He's got just enough left over in this economy to buy a personalized plate. 2) Things are going so poorly that he's taken up a new vocation as "Highway Pirate." 3) Chronic hemorrhoids and laryngitis combined but he still wants you to know he's in pain. 4) He couldn't fit Joseph of Aramathea's final words (regarding the Holy Grail) so he opted for the last final word (final last word?). "He who is valiant and pure of spirit may find the holy grail in the Castle of Arrgghh.."
I think you got it with the pirate one. 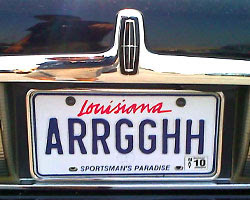 As you probably know, Louisiana has a severe pirate problem.